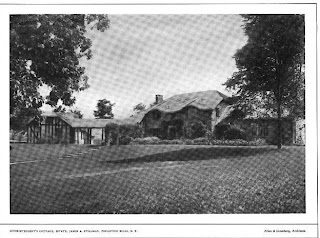 'Mondanne', the James A. Stillman estate designed by Albro & Lindeberg c. 1910 in Pocantico Hills, New York. Stillman was Chairman of the Board of the National City Bank. 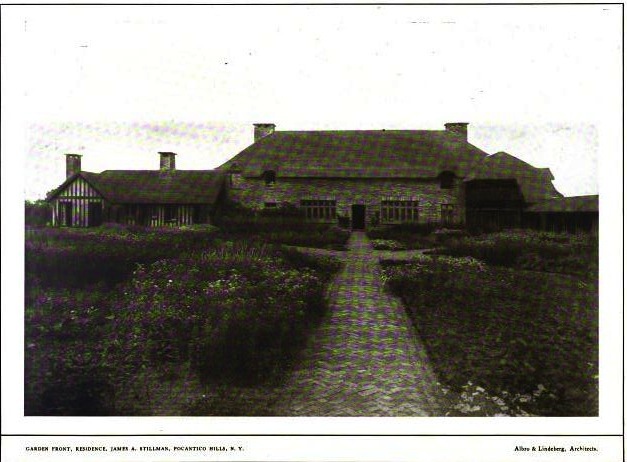 'Mondanne' sat on over 400 acres and adjoined 'Kykuit', the John D. Rockefeller estate. Stillman's sister Sarah was married to William G. Rockefeller and sister Isabel was married to Percy A. Rockefeller. In 1929 Stillman's yacht, Wenonah II, exploded and burned in Glen Cove, Long Island. Three years later 'Mondanne' suffered a fire that destroyed the entire house. ** To complete the trifecta, in 1926 Stillman's New York City residence at 9 West 52nd Street suffered a fire on the top floor which caused extensive water damage throughout the house. And to add insult to injury, before the fires at his city and country residences and yacht, his brother was made an honorary fire chief (Dr. Ernest G. Stillman). 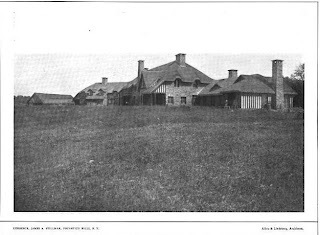 Photos from Architecture, 1912. It is a very interesting house, in both plan and elevation. I am curious of how the entrance was handled as I don't think it is shown in the photos. The entrance is indeed puzzling and not very clear. 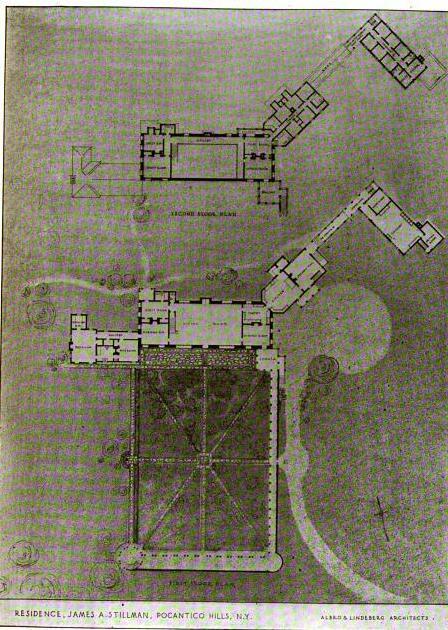 The first photo shows what appears to at least be part of the perimeter shelter that was meant to enclose a courtyard as indicated on the plan. More on this,"Mondanne", in French means(Anne's World)The book that desribes the family and estate is called POCANTICO, Fifty years on the Rockefeller Domain. 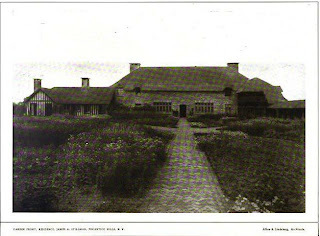 Printed 1964.The thatched roof on all buildings on the 175 acre estate were actually rolled shingles. 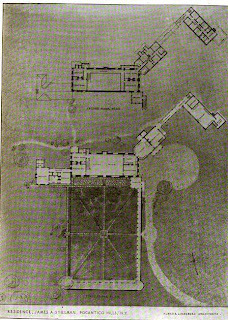 The extant building left could be either the one wing of the main house or it could have been Gray Cottage, the Blue cottage or possibly the laundry building. I'm sore it wasn't the red Cottage because it had an apple tree growing through it! map-it. It is located between Bedford and Sleepy Hollow Road. 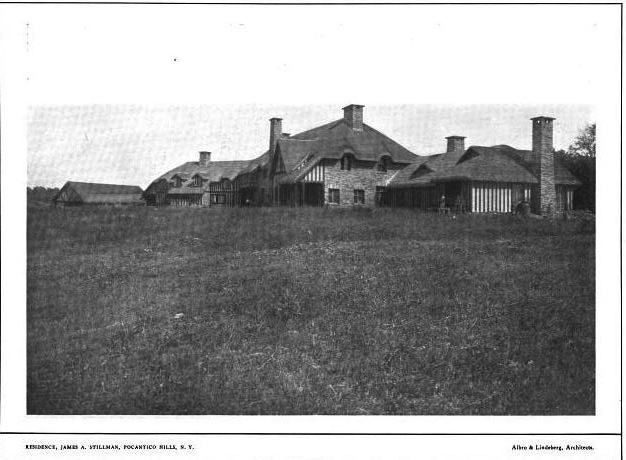 "Mondanee" (also known as the Thatched Palace"), was situated on a long oak? tree lined drive that you entered from Bedford Rd.the gates there originally were connected to a thatched gate lodge. Currently you can see a lot from Stillman Rd. I am guessing the new current house is not exctly where Mondanne sat-but close by.I wonder if there is a change of height there to allow for the lower level entrance to accend to the first floor...? on the far end must have been demolished. With the amount of the estate left, I would be suprised if these were removed. rock lined streams, carriage house, stables, the gardener's cottage, (also known as the Red Cottage) and had the apple tree growing through the roof, greenhouses, a potting shed - all are matching in style. I grew up in the Red Cottage. Pieces of the apple tree still exist in the attic. I remember the main house, probably the most romantic house I have ever seen. I was but a child yet freely roamed the place and played in the courtyard and corner pavilions regularly. Fifi was gone and the Rockefellers eventually owned it and tore it down in 1971 (despite my father's protests to them to preserve it). The estate was featured in the November 1910 issue of the Architectural Record. My mother has a photograph of the Red Cottage, with the apple tree growing through the west half-timbered wing, in the hallway. I also know the other cottages quite well.